A couple day’s ago Lizzie posted a Transformation Tuesday post on the Papertrey blog. I’m really loving this new feature! I went through the photos of my old cards and found one that has been annoying me for way to loong! 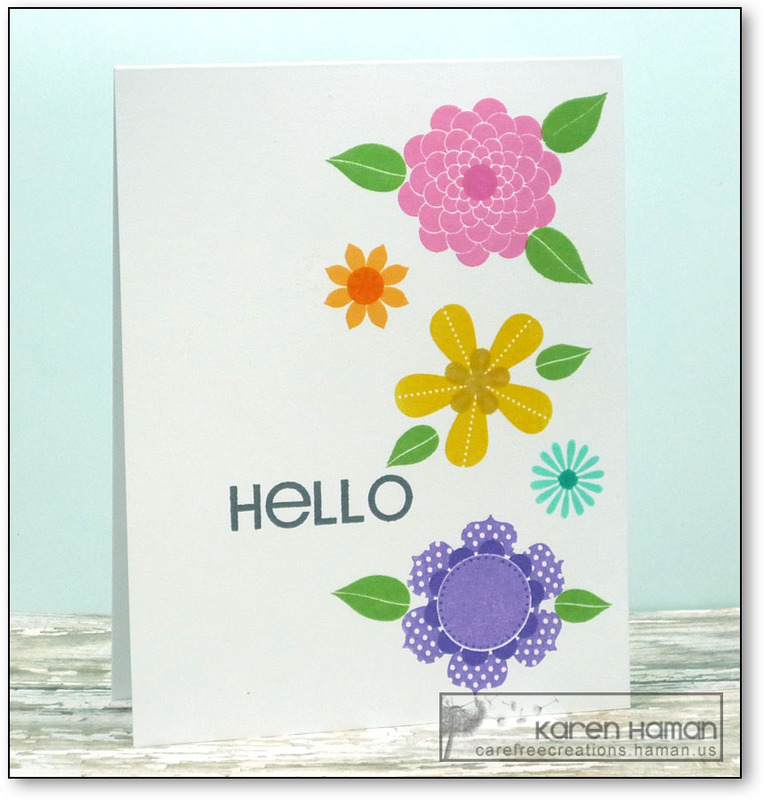 This Beautiful Blooms 2 card was given away before I noticed that I hadn’t stamped any center image in the purple flower at the bottom. It just felt incomplete! In addition to that, I was not happy with the blotchy images (I stamped without a positioning tool) and the leaves feel like they are floating. While I did get the leaves closer to the flowers and the flowers feel fuller, I still wasn’t happy. The yellow is way to bright and feels out of place; also, since I used yellow for centers, I took yellow out of the flower lineup…and that had me doing other changes that resulted in a teeny tiny blue flower at the top – ugh! This time I feel like I got it right (mostly). I went back to the rainbow flow of flowers but made the accent colors in the same color family. It just feels more cohesive. The only thing I would change would be to pay more attention to the orientation of openings of the flowers for leaves. I didn’t know where to stamp my leaves, so I stamped my sentiment first and once I added the leaves, I wish the sentiment was just a bit lower. As I say though, done is done (and it is tons better than the original). The orange flower is from the flower cluster in Back Pocket Basics. I needed another flower so I didn’t repeat, but I also wanted one that fit the style. 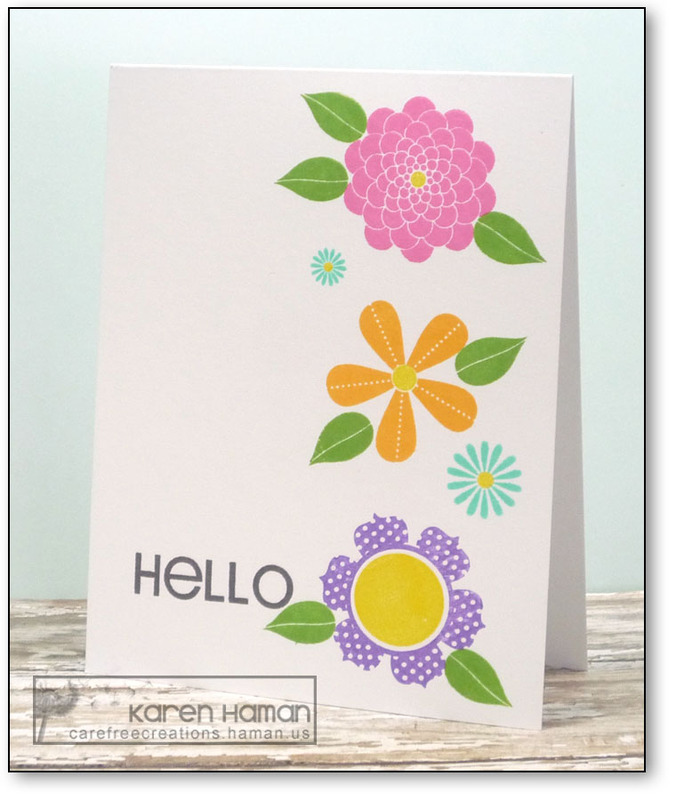 This entry was posted in cards, Papertrey Ink and tagged olc by karen h. Bookmark the permalink. Karen, I like all three of them, even the first with the missing middles! They are all lovely but my favorite is the 2nd one, I like that bright yellow! I’m loving this challenge, too! So great to take the time to improve an old idea that wasn’t quite right! I love your re-dos!